1860 Presidential Campaign Abraham Lincoln Postal Cover Complete with Flap, Unused, Near Mint. Vignette Image at the upper left is printed in black on white paper. It shows a central image of a beardless Lincoln with "The Peoples' Candidate For President Abraham Lincoln" below, a Liberty Cap above and is draped along both sides with American flags. 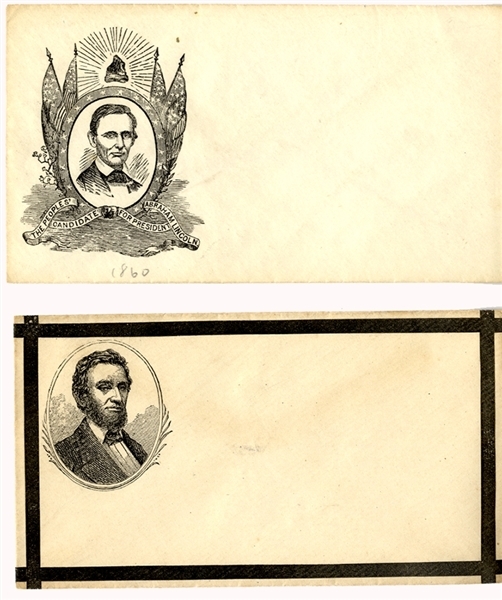 ... plus, Mourning ruled cover with Lincoln engraved image . Unused, Near Mint.